Get the NEW Z Streaming App! If you love listening to the Z family of radio stations, then you’ll love this announcement! Your Z has been working behind the scenes on a brand new app that will let you reliably stream ALL four stations. 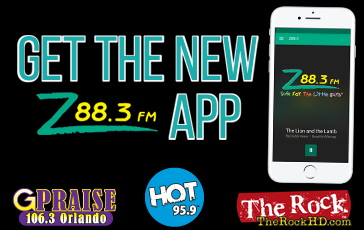 Now you can take Z88.3, GPraise, Hot 95.9 and TheRockHD.com with you anywhere you go! This is a brand new and improved app that you can download right now! Just go to your phone and head on over to the app store. You can also click on the Apple or Android button below if you are reading this from your mobile device. Get the new streaming app for Apple and Android! If you love artists like Mercy Me, Chris Tomlin, Casting Crowns, Jeremy Camp and tobyMac, you’ll love listening to Z88.3. Get to know new friends like Ellis and Tyler on Z88.3 Mornings, Tracy Leek on Z88.3 Middays, Suzanne and Shadow on Z88.3 Afternoons, Tom Dupree on Z88.3 Evenings, and Z88.3 Late Nights with Alana. You can also find each one of them on Facebook. Z88.3 promises to always be Safe for the Little Ears in the backseat and will keep you up to date with the latest news, Stress Saver Traffic and Weather Warnings First to help you keep your family safe. If anyone in your family loves hip-hop artists like Lecrae, Andy Mineo or Social Club Misfits, they’ll enjoy listening to Hot 95.9. Red, Skillet and Thousand Foot Krutch and all things rock fans will love listening to TheRockHD.com. If you listen to Urban Gospel music and enjoy artists like Hezekiah Walker, Tamela Mann and Israel Houghton, your family will enjoy GPraise.